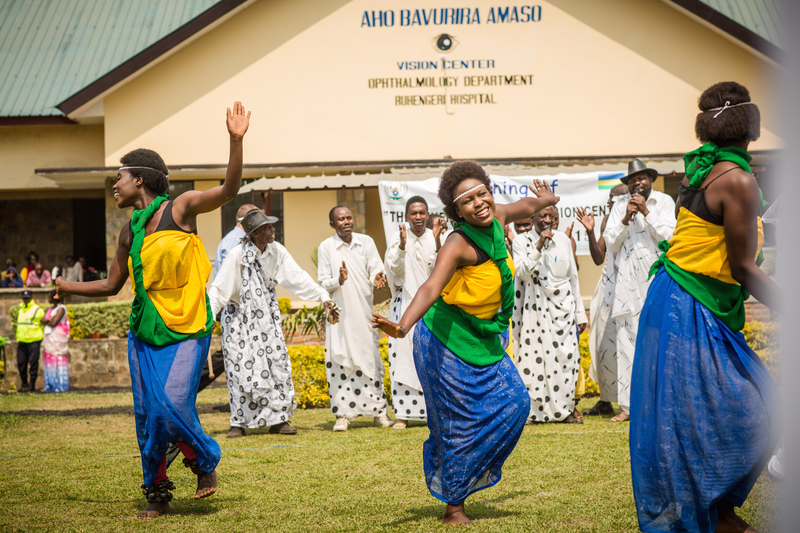 OneSight opened its pilot vision center in Rwanda in July 2015, which provides access to quality vision care to 360,000 Rwandans living in Ruhengeri, part of the Musanze district in Rwanda’s Northern Province. The pilot, which ran from July to November, exceeded all sales and traffic plans, and is on the path towards sustainability. With one vision center open, over 5,000 patients have been served and over 600 pairs of glasses have been sold to date. One of the first patients to the vision center was a 72-year-old man named Gregorie. Gregorie never previously wore glasses but as he aged, his vision worsened and he could no longer continue his work as a brick maker because his vision was so poor. Eventually his vision was so bad that he spent most of his time at home. Because of the vision center, Gregorie was finally able to get a pair of glasses made with his exact prescription, at a price he could afford. Now with his glasses, Gregorie has the ability to be part of his community again. He can see his wife, his children; he has his life back and the ability to enjoy it to the fullest. OneSight has signed a memorandum of understanding with the Rwandan Ministry of Health to move forward with expansion of the sustainable model across Rwanda. In 2016, this will include the opening five vision centers and a central manufacturing facility; the first of which will open at the end of May in Rwamagana, a city located in the Eastern Province of Rwanda. By the end of the year, over 1.7 million Rwandans will have access to affordable, quality vision care. OneSight is targeting to provide access to the entire population of 12 million people by 2018. One key component of OneSight’s sustainable model is empowering and training the local community to run the vision center. Four new jobs were created with the opening of the first vision center. That number will only continue to grow with the expansion and will create jobs as well as introduce new skills into the community such as lens manufacturing. Spreading awareness of the value of vision care is also a key priority of the work in Rwanda. OneSight, and a team of expert Luxottica volunteers, led the training of the Rwandan health center nurses so they are better able to identify vision and eye health issues in patients and refer them, if necessary, to the hospital vision center. With the countrywide expansion, OneSight will continue to invest in personnel training and education to ensure the success of the vision centers. OneSight has also partnered with the University of Rwanda to provide continuing education for all of the Ophthalmic Clinic Officers (OCO) across the country. The training will be led by Luxottica volunteers and will include training on refraction, dispensing and fitting of glasses. Previously this education was provided in a classroom setting via textbook, but now will be provided via practical application with first-hand experience for each OCO, helping them to maintain their certification with improved preparation and education. For OneSight, the commitment to the country is about more than building vision centers, but also to empower the local population with the tools and knowledge they need to ensure vision care access will be provided to Rwandans by Rwandans for years to come.